Want to help grant our next wish? Click on the Donate Now button. Lacrosse for Wishes is a non-profit summer lacrosse program where for kids to participate on a team, they need to raise money for Make-A-Wish. Our motto is “for kids, by kids”. During our first two years we have raised $45,000 to grant wishes for children in our Make-A-Wish chapter which represents Ohio, Kentucky, and Indiana. This year we have raised over $40,000 and we are still going thanks to all the hard work of our players and their families. Each player has a personal goal of raising $500 through her personal Make-A-Wish Website. Our program’s focus is to teach our kids not only to be better players on the field, but also better people off the field by teaching the importance of philanthropy and giving back to your community. 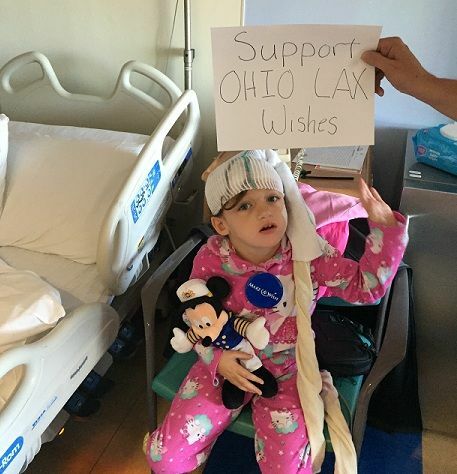 Lacrosse for Wishes Southern Ohio is a non-profit organization under section 501 (c) of the United States Internal Revenue Code. Please contact us if you need our Employer Identification Number. How do Make-A-Wish wishes come true? Amazing story about the charity we support, Make-A-Wish, and how they are are making an impact on the lives of children around the world with life threatening illnesses. Our niece and Wish Kid, Grace Brown, during testing at the hospital on 10/18/2015. This is a picture of our adorable niece, Grace Brown, taken on 10/18/2015 while having testing done at a hospital in NYC. Grace was granted a wish from Make-A-Wish in Long Island, NY in May 2015 where her whole family were sent on a Disney Cruise for a week (notice Captain Mickey). Grace has had epileptic seizures since she was a baby and continues to undergo testing and procedures to understand why the seizures happen to hopefully stop them from occurring. Donate to or become a sponsor of our Lacrosse For Wishes team so that we can help kids like Grace in our community with life threatening illnesses feel "normal".